Echobode is a delay effect with a frequency shifter placed inside the feedback loop. The frequency shifter algorithm is inspired by the classic Bode Frequency Shifter (named after its inventor Harald Bode). 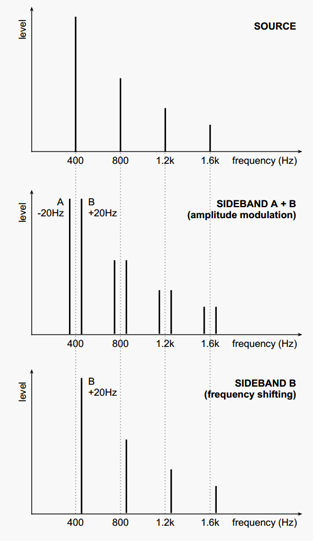 The difference between a frequency shifter and a pitch shifter is that it shifts the audio spectrum linearly. E.g. an overtone series of 100, 200, 300 Hz can be shifted by 50 Hz to 150, 250, 350 Hz, making the overtones inharmonic. This effect in itself is great for creating metallic bell timbres, but putting it inside a delayed feedback loop opens up many other possibilities. 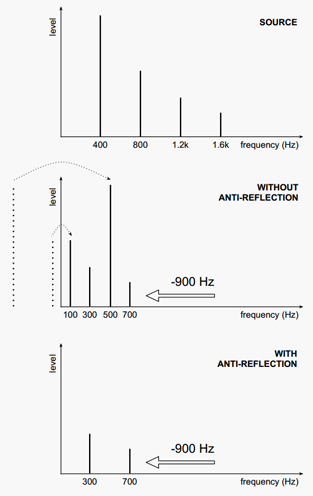 Echobode features a unique "anti-reflection" stage that removes "negative" frequencies (frequencies that are shifted down beyond 0 Hz and would otherwise bounce back into the audible spectrum). This stage also eliminates frequencies that are shifted up over half the sample-rate ("nyquist"). The delay time can be synchronized to tempo and it can be modulated to create chorus type effects. The delay uses an "all-pass interpolation" technique that is low on aliasing and will preserve all the high-frequency energy of your source signal (even when time is being modulated). Even with no frequency shifting taking place, Echobode is useful as a high quality echo effect with subtle phase smearing properties on the feedback. A built-in sine LFO can be routed to modulate the frequency shifting amount, the phase shift or the delay time. The LFO can be tempo synchronized and put into stereo mode to generate inverse modulation for the right audio channel. Even in synchronized mode, rate changes are smooth and will not cause sudden jumps. Echobode has no latency and has a consistent sound on all supported sample rates. It is CPU friendly and automatically "suspends" itself, taking 0% CPU when its inputs and outputs are silent. You will find lots of CV inputs on the backside and separate outputs for the two sidebands. Bundled with the product are many patches, combinators and song files that will demonstrate the many different identities that this deceivingly simple looking effect can assume.